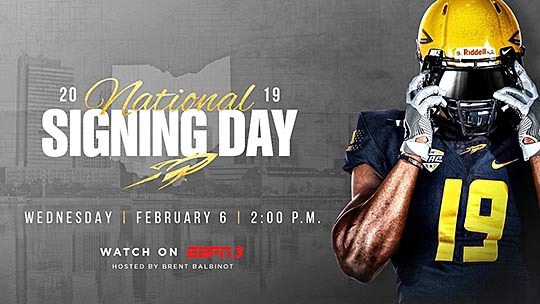 The University of Toledo will produce and air the 2019 Rocket Football Signing Day Show on ESPN3 Wednesday, Feb. 6, at 2 p.m.
Brent Balbinot, the voice of the Rockets, will host the one-hour studio show along with Toledo Head Football Coach Jason Candle and the UT coaching staff. The coaches will review the Rockets’ 2019 recruiting class and show video highlights of each signee. Feb. 6 is the first day of the second signing period in which high school seniors are allowed to sign national letters of intent. The Rockets signed 18 recruits during the early signing period Dec. 19. The Rockets will open the 2019 season at Kentucky Saturday, Aug. 31. The home season includes six games, including a Sept. 28 matchup with Brigham Young University. UT employees and retirees may purchase tickets at half-price; UT students are admitted free with ID. For season ticket information, call 419.530.GOLD (4653). This entry was posted on Monday, February 4th, 2019 at 3:21 am and is filed under Alumni, Athletics, Events, News .